Don’t worry. It’s not what you think. But the way he looked at that chicken breast wrapped in bacon and stuffed with cheese, you would have thought he was having an affair with another woman. And of course, he ate the whole thing in front of me, occasionally waving bits of meat and bacon in my face to lovingly offer me a bite. Gee, thanks, Honey. You’re so kind. If you’re just tuning in, my husband and I started a juice cleanse on Monday, and Wednesday was our third day– the minimum amount of days I wanted to go for. Addison decided the special on today’s menu in the cafeteria was too good to pass up, so he ended his cleanse after breakfast on the third day. And like a dummy, I ate (well, drank my juice) with him and another good friend of mine. The past two days on the cleanse, I just kind of avoided being around food which made it easier. After all, the juices do fill you up sufficiently. You would think since originally the juice cleanse was HIS idea and I was the one who dragged my feet on finally starting it, he would have been more into it. But oh well. All good things must come to an end. When I IMed him at work to tell him the name of this blog post, he laughed and told me to make sure the disclaimer was high up (originally I was going to describe his chicken breast like a woman to really throw people off, but apparently that’s not cool. Understandable). WHO EATS CHICKEN ENCHILADAS AT 3:30 in the AFTERNOON????? Then we get home, and he hands me coupons for pizza and burgers, which he then takes back to CLIP them out and hang them up on our bulletin board. But it wasn’t the psychological aspect that was hard. By the end of the day, I just really wasn’t feeling well physically. I had heard that the first three days of the detox would be rough. But so far, it had been AWESOME. Not the third day. Nope. I basically laid on my couch for the rest of the evening, drinking my juice and being…well…detoxed. And if you don’t understand what that means, you probably shouldn’t go on a juice detox. That being said, now I feel great. But we decided to end the juice fast for money reasons and for the fact that I’ve been itching to exercise. The truth is, when you’re doing a fast like this, you really can’t exercise to the extent you normally would. You don’t have enough energy and your body is too busy flushing out the toxins. It would honestly overdo it. Sure, you’re recommended to do light/low-impact exercise like walking or swimming. But other than that? Nope. I probably would have continued juicing today if I had more time. With not feeling well, I didn’t get to juice last night and we overslept this morning. But now I’m enjoying the aftermath, which I’ll get into more with a later blog. But unlike my husband who may or may not be chowing down on a pizza buffet with a buddy this afternoon, I’m going to try to wean myself onto solid foods again slowly– starting with veggies. I’ll let you know how it goes! 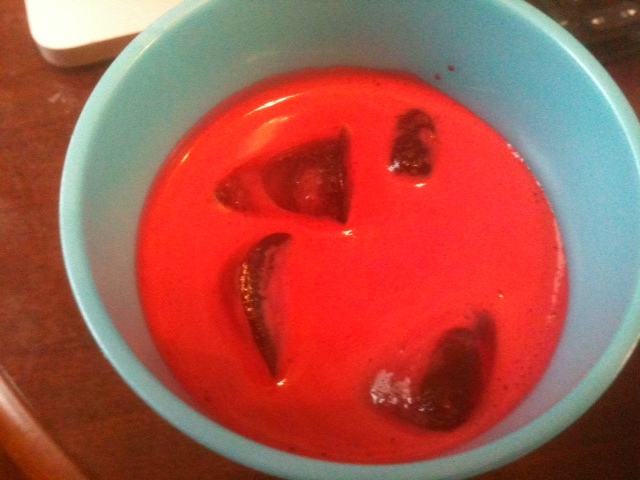 Oh and by the way, BEET JUICE IS AWESOME. Recipe of all the juices the past couple of day are coming soon!